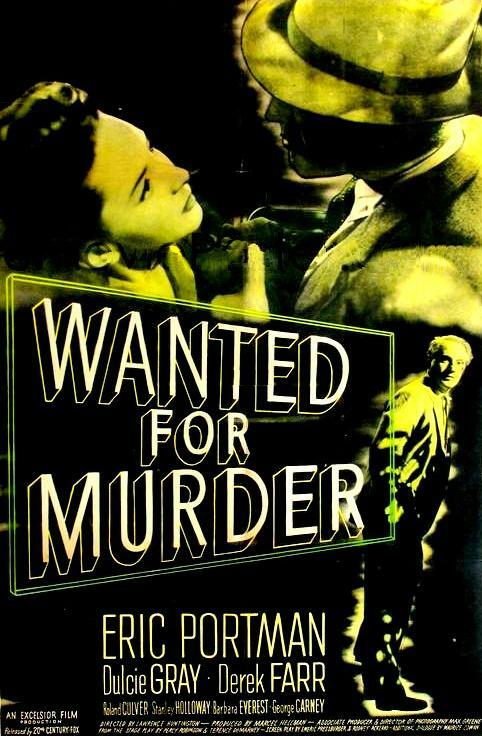 Lawrence Huntington’s Wanted for Murder, which was originally released on June 17, 1946, in the U.K., premiered in the United States on November 2, 1946. 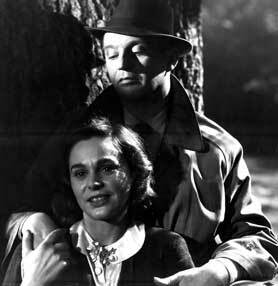 It’s an effective chiller with a dependable cast and an excellent screenplay by Rodney Ackland and Emeric Pressburger, based on the stage play by Percy Robinson and Terence de Marney. The film boasts a terrific sense of place, with scenes filmed in Hampstead Fairground, Madame Tussaud’s wax museum, and the center of London (which, when necessary, appears as rear screen projection stock footage, a technique that can be distractingly fake-looking but here is done fairly skillfully). There are also several atmospheric nighttime murder sequences in Hampstead Heath, Regent’s Park, and Hyde Park. Particularly effective is the music by Mischa Spoliansky, whose pop-orchestral tune “A Voice in the Night” is a motif that follows the murderer around like his shadow, and which you’ll be hard-pressed not to hum after seeing this picture. Eric Portman plays middle-class mummy’s boy Victor James Colebrooke, a man who feels haunted by the specter of his late father, William Colebrooke, an executioner to Queen Victoria whose eerie likeness stands in Madame Tussaud’s. Colebrooke is a handsome, superficially charming gentleman who drink Hendrick’s Gin, lives at home with his mother and a servant, and whose single-breasted suits often sport a white boutonniere and a pocket square. He’s the embodiment of the British fascination with “the murderer next door” — the outwardly ordinary man whose wife’s remains are bricked up in the basement or who strangles working girls on the weekend. Wispy brunette Dulcie Gray plays Anne Fielding, a young woman who works in a gramophone shop and is dating Colebrooke. A starry-eyed young bus conductor named Jack Williams (Derek Farr) finds her waiting at the fairgrounds and mashes her as hard as he can. She’s attracted to him, but Colebrooke is manipulative and possessive. Rounding out the fine cast are Roland Culver as Chief Insp. Conway and Stanley Holloway as Sgt. Sullivan, the two Scotland Yard detectives who are on the trail of the killer. Their scenes are some of the film’s most light-hearted, but they are never less than professional, and are dogged in their pursuit of the strangler. When the first murder occurs, the audience doesn’t know who the killer is, but we strongly suspect Colebrooke. It’s not long before the film removes any doubt about his guilt, which allows for a more interesting and creepy character study than in a whodunnit, where the murderer’s identity is a secret up until the climax. Most of the film is a game of cat and mouse, with the detectives fairly certain Colebrooke is guilty, but unable to gather anything but circumstantial evidence. Colebrooke blames his sickness on his father, whose killings were all committed in the course of his duty, but whose grim pride in his work earned him the nickname “The Happy Hangman.” The Freudian-minded viewer might blame his overbearing, possessive mother, but the film itself doesn’t draw any such trite conclusions. His father is just a picture on the wall or — in one scene — a disturbingly realistic wax figure, and his mother isn’t a bad person, even encouraging him to find a nice girl and marry her. Posted in 1946, June 1946, November 1946 and tagged 20th Century-Fox, Barbara Everest, Bill Shine, Bonar Colleano, British Cinema, Caven Watson, Derek Farr, Dulcie Gray, Edna Wood, Edward B. Jarvis, Emeric Pressburger, Eric Portman, Excelsior Films Ltd., Film Noir, George Carney, Gerhard Kempinski, Jenny Laird, John Ruddock, John Salew, Kathleen Harrison, Lawrence Huntington, Marcel Hellman, Marcel Hellman Productions, Mary Mackenzie, Maurice Cowan, Max Greene, Mischa Spoliansky, Moira Lister, Mutz Greenbaum, Percy Robinson, Rodney Ackland, Roland Culver, Stanley Holloway, Terence de Marney, Viola Lyel, Wally Patch, Wanted for Murder, Wilfrid Hyde-White. Bookmark the permalink.